Logitech has extended its popular nano-receiver to other mice within its peripherals range – after the tiny USB device proved to be popular on the VX laptop mouse. 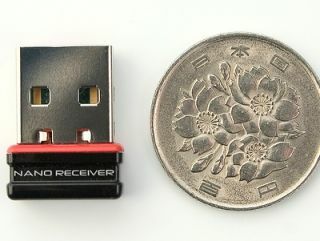 The nano-reciever was Logitech's answer to people having to either unplug their mouse or risk damaging a cumbersome plug-in receiver that sticks out when carrying a laptop around. The VX Nano's answer to this was a tiny nano-receiver, which was small and unobtrusive, and the idea has now been rolled out further. "When plugged into a laptop, the nano-receiver is nearly flush against the notebook – protruding just 8 mm from the edge of the computer – so you don't have to hassle with unplugging and plugging in the receiver for fear that it will snap off during transport," explains Logitech. "…we've added this feature to a number of our mice, including the V550 Nano and V450 Nano." And for when you do unplug the very small (and therefore very easy to lose) dongle from your laptop, Logitech has even created little compartments within the mice to store it away.